On our way back to SLC, we decided to take a different route. Instead of following the interstate back to Utah, we used Thousand Springs Scenic Byway (US 30) which follows the Snake River toward Twin Falls. Before Twin Falls, we split south on US 93 to Jackpot, Nevada, a town built expressly for gambling, and then on to Interstate 80. 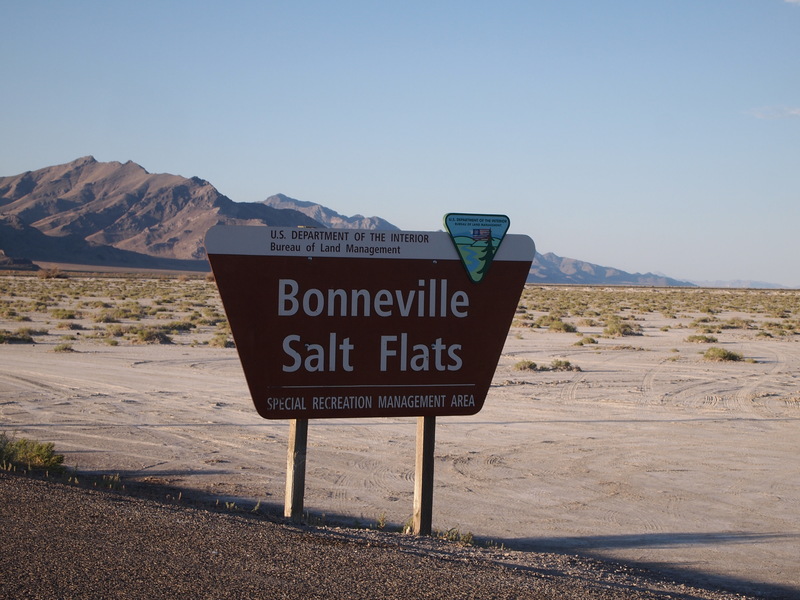 Our destination: Bonneville Salt Flats. 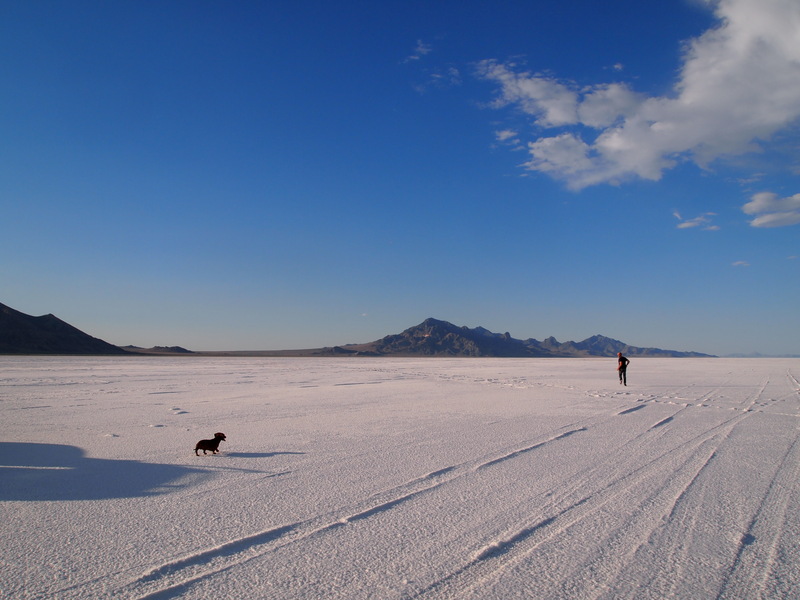 The Bonneville Salt Flats sits on the Utah-Nevada border along I-80 and stretches over 30,000 acres of land adjacent to the Great Salt Lake. 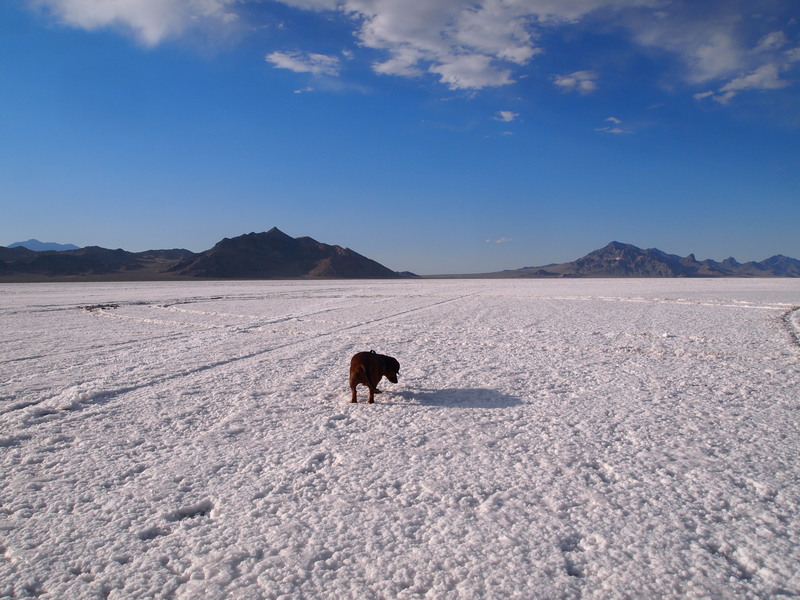 The salt flats is the result of ancient Lake Bonneville’s evaporation; all that remains of the lake which once filled the Great Basin is the Great Salt Lake. 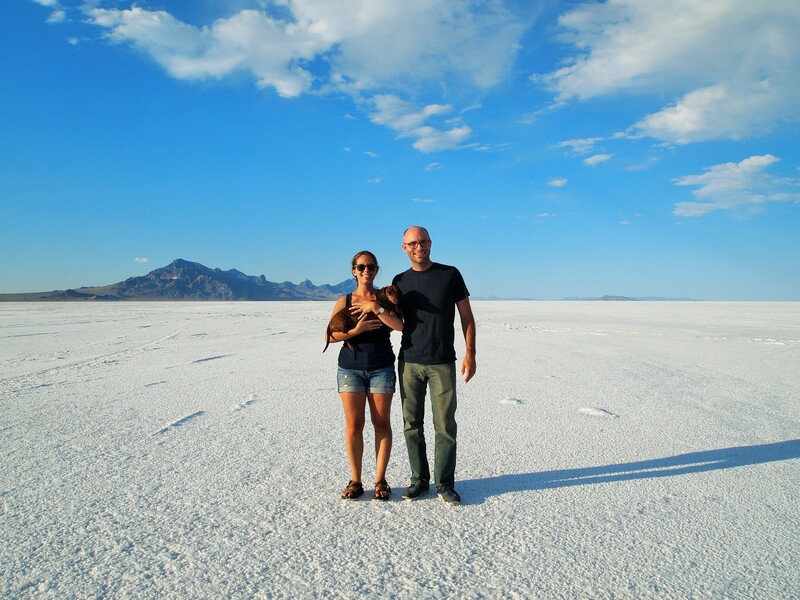 The salt flats is deceiving. From a distance it simply appears to be a sandy desert, but as you draw nearer it looks like a field of fresh snow. 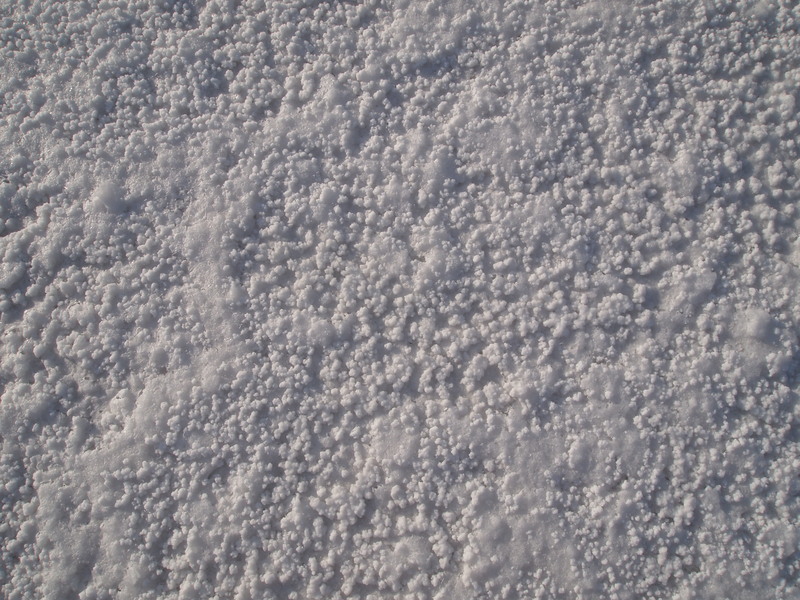 Only once you are on top of it, does it actually look like hard-packed salt. 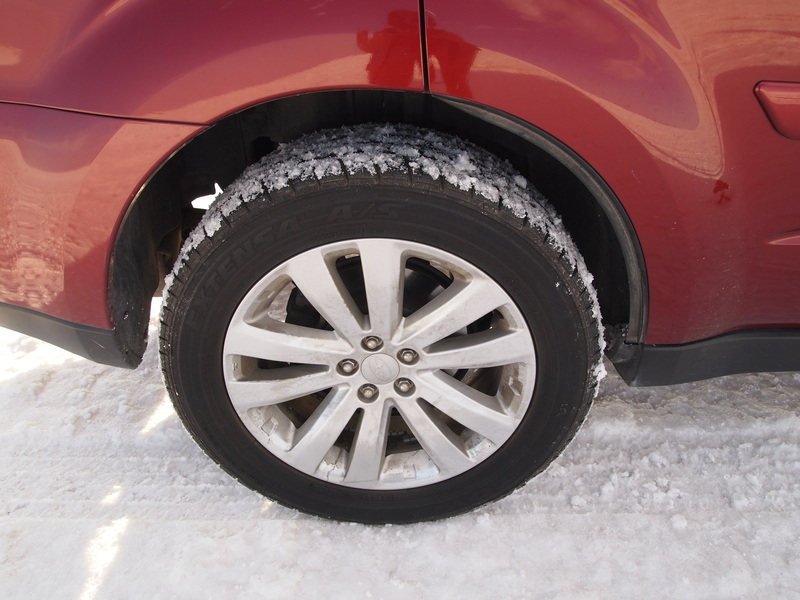 Even then, the salt stuck to our shoes and tires like snow, but with much more resiliency. Even a car wash didn’t completely remove all the salt. Like walking in White Sands, the sun’s rays reflected off of the salt’s surface making it incredibly bright and sweltering on the flats. Truman quickly grew dehydrated, and even Zach and I were rather parched by the end of our visit. 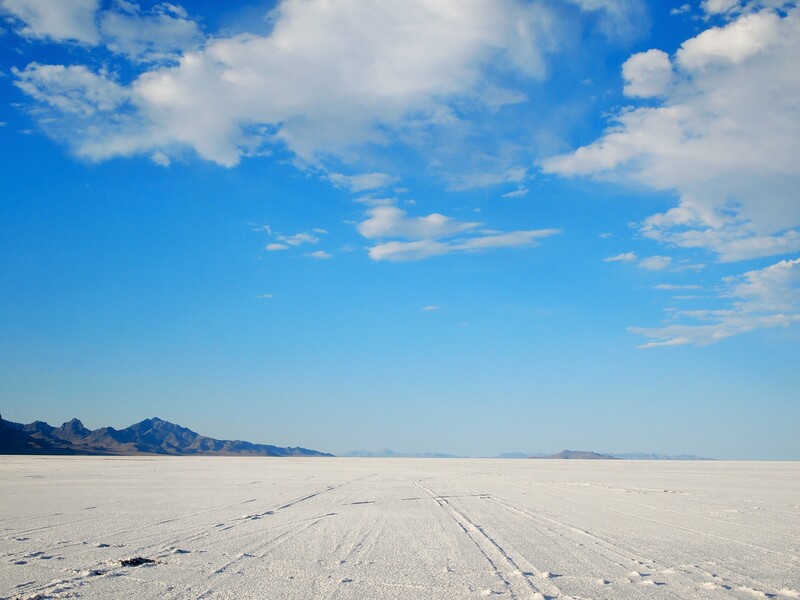 The first recorded crossing of the Great Salt Lake Desert was made by John C. Fremont’s survey team and his guides, Kit Carson and Joe Walker, in 1845. Although Joe Walker’s accounts of the desert encouraged pioneers not to attempt to cross it, Lansford Hastings followed Fremont’s route shortly thereafter and enticed pioneers to follow it in his book, The Emigrants’ Guide to Oregon and California. The route Hastings offered, called Hastings Cutoff, suggested travellers leave the California Trail at Fort Bridger, Wyoming, to cut through the Wasatch Range, travel over 80 waterless miles of the Great Salt Lake Desert, and circumvent the Ruby Mountains to rejoin the California Trail near present-day Elko, Nevada. Though this cutoff reduced the journey by 300 miles, it was a much more treacherous and less-established trail. Brigham Young and the Mormon pioneers used the beginning of Hastings Cutoff to great success in their founding of Salt Lake City in 1848, however, the Donner Party had much less luck two years earlier in 1846. The group lost valuable time cutting a trail through the Wasatch Range, and then lost wagons and livestock to the harsh desert environment and sticky salty surface. 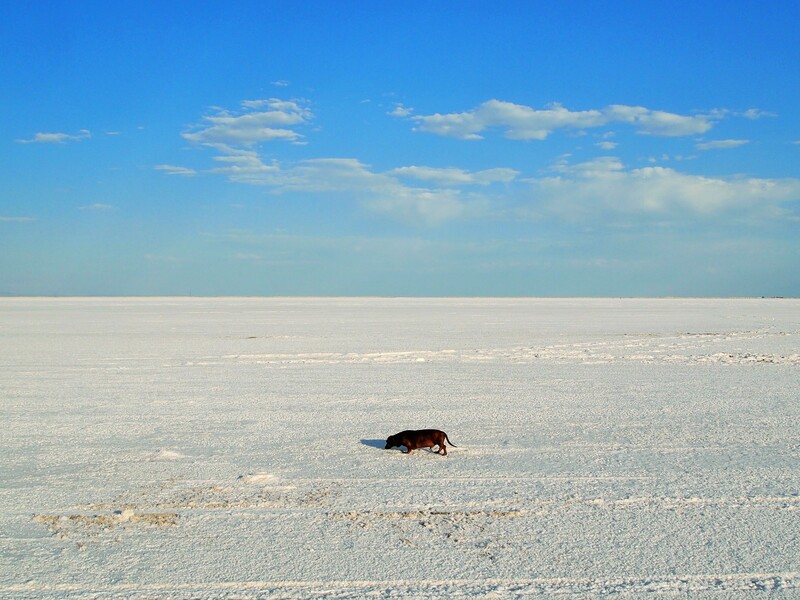 The tracks from their wagon trail could still be seen in the Great Salt Lake Desert 90 years later. Although the Donner Party made it to the Sierra Nevadas, they were weeks behind schedule and didn’t make it over the pass before the harsh winter snows began. The rest is history. Artifacts from the Donner Party were found in the Great Salt Lake Desert for years to come and are now housed in the Donner- Reed Museum in Grantsville, Utah. The museum is currently closed for renovations, but I hope to visit when they re-open.